Nimbus Blogger Template is a high-quality, user-friendly, business blog design. A must try for daily writing blogs, Viral News Publishers, and Magazines bloggers. It comes with awesome features and widgets that you ever found in any premium blogger theme. So if you’re looking for any professional and unique looking theme then. 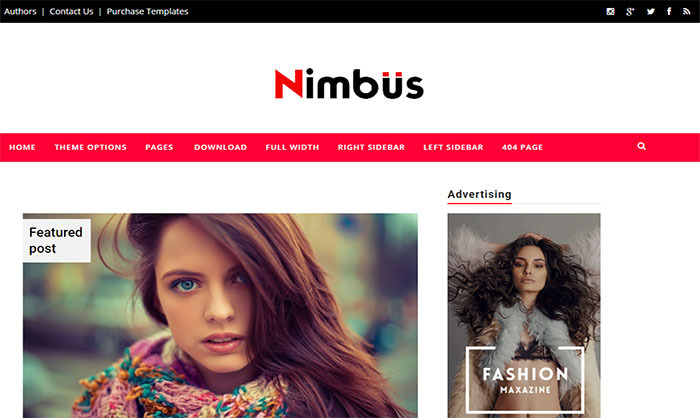 We highly recommend you to go for nimbus blogger template. This template does not come with any features like we always do with our other blogger templates, instead. We have gone with keeping it simple approach and the main focus is the content. So your readers will be able to browse your blog smoothly. One of the biggest reason of using this template is that it has shiny and attractive style design that help your readers to browse your website easily. If you’re going to start new fashion website then this template is going to be your first choice because it’s not any ordinary looking theme like others. It has a creative design that can turn you ordinary looking blog into professional one and give it a unique look. So we recommend our readers to choose a theme that will not only make your blog beautiful but also make it super fast loading.